We have a mailing list of families looking for this pig. 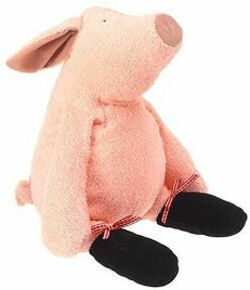 We are looking for a Manhattan Toy Co. Pierre Pig. He is around 18 inches in height, pink and made from a plush towel fabric, filled with foam type material and beans. I think it was from around 2004. This Pig (Piggy McTrotsky as he was known) was bought for me by my now wife in 2004. Ever since then he has become a very important part of our family. He has managed to get us through some very dark times and has been there through the ups and downs. My wife and I have been trying to have a baby for around 2 years. As it turned out, for various reasons, we were not going to be able to and were looking at the fact that we might never be able to. Then out of the blue, and for reasons nobody knows, my wife fell pregnant. Our original pig has been loved so much that unfortunately he has severe wear due to the amount of love he has had and is in no state to be passing on to a new baby. We would dearly love to be able to find another pig, so we could pass it on to our first baby, so it can, too, experience the joys of his/hers own little piggy. Thank you but it is really the large version I am after. But again thanks for the info.